Make no mistake, Yellowstone National Park deserves more than a day. You could easily fill an entire week with great hikes, amazing scenery, and incredible wildlife encounters. But there are plenty of reasons why you might not have that kind of time. 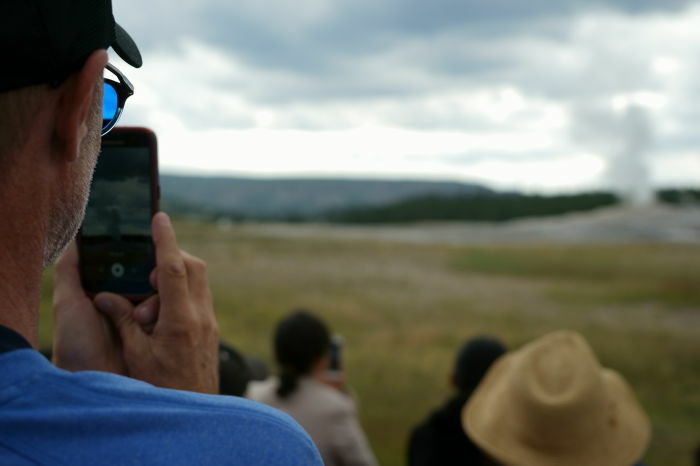 So, here’s a look at how I saw Yellowstone in one day. My one-day itinerary in Yellowstone National Park begins at the northeast entrance (at the end of the stunning Beartooth Highway) and ends at West Yellowstone, Montana. Lamar Valley is between the northwest entrance and the Tower-Roosevelt junction. Tower Fall is just south of that junction. 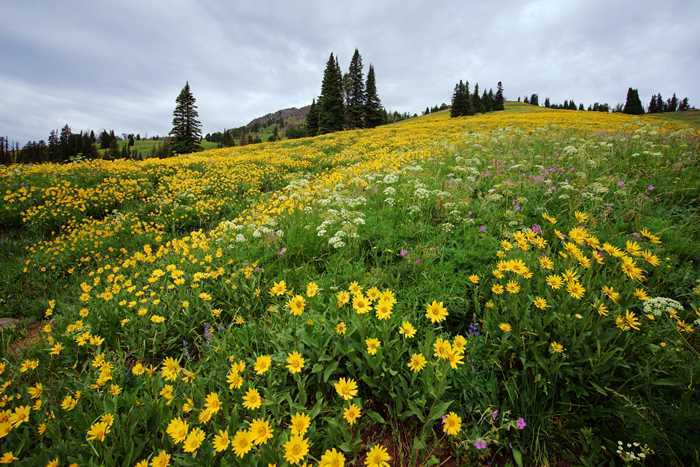 Continue south to see Dunraven Pass and hike the Mount Washburn Trail. At Canyon Village Junction, head south a bit to see the Grand Canyon of the Yellowstone. Then, head west, through the middle of the park to Norris, and head south to Old Faithful. You’ll need to backtrack north to Norris, then head west, to reach the west entrance and West Yellowstone. I wouldn’t recommend seeing Yellowstone in one day if this is your first visit to Yellowstone National Park. Since I have been here before, and my visit was at the very end of my vacation, I considered the drive through Yellowstone as just a very scenic way to get from Billings to Salt Lake City. But, since I had the entire day, I figured I’d try to revisit some old favorites along the way. First up was the Lamar Valley. 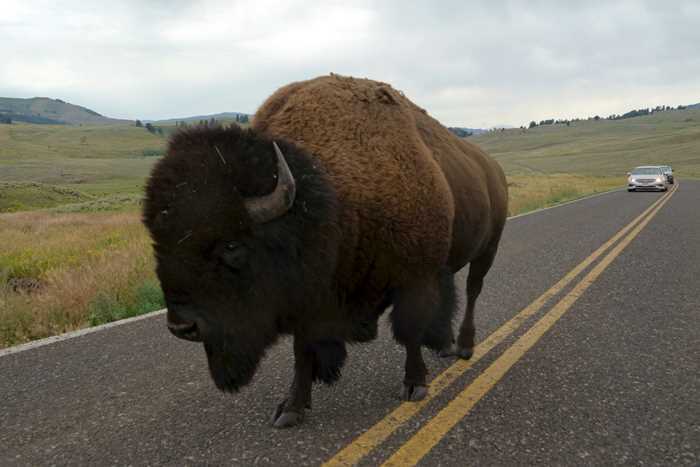 This wide-open stretch of the park road is populated with one of Yellowstone’s two bison herds. You will see bison in Lamar Valley. I’ll give you a closer look at them on a separate page. Tower Fall is so close to the road, you can actually see the road in this picture (if you look very closely). That means it’s an easy attraction to visit, without investing a whole lot of time. 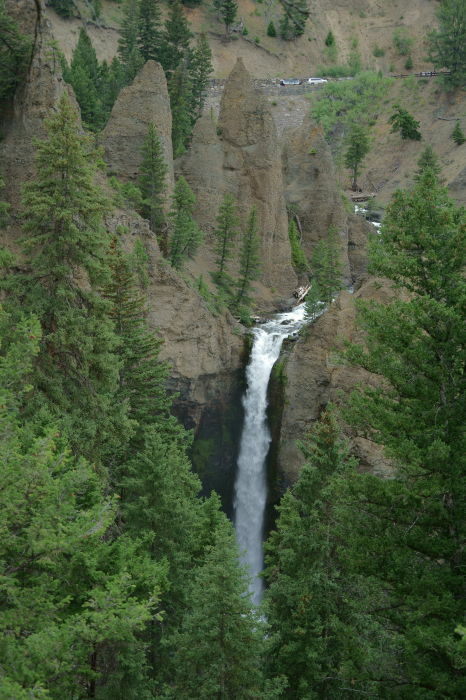 Here, Tower Creek slips between some interesting rock pinnacles, before dropping 132 feet. There is just one viewpoint for Tower Fall, and it’s a very short walk from the parking area. As you can see, I wasn’t alone here. This was the first of many places where I realized that visiting Yosemite in July is not a good idea, simply because of the volume of tourists. At least at this attraction, I was able to find a parking spot. It became much more difficult down the road. There is also a trailhead at Tower Fall, which goes downhill towards Tower Creek. It’s a 1-mile roundtrip, but a sign at the trailhead warns that there is no view of Tower Fall from the trail. If you’re trying to see Yellowstone in one day, I’d suggest skipping this hike. I also visited Tower Fall on a previous trip to Yellowstone. You can check out that visit here. As you make your way south from Tower Fall, you’ll enjoy some of the most beautiful scenery in Yellowstone National Park. The road climbs up a hillside, giving you a sweeping view of the valley below. There are a few turnouts that make it easy to stop and take some pictures. Unfortunately, the skies were grey, but it was still beautiful. As you climb the hill towards Dunraven Pass, you’ll see a dirt side-road that leads up the base of Mount Washburn. The road ends at a large parking area, where the Mount Washburn Trail begins. 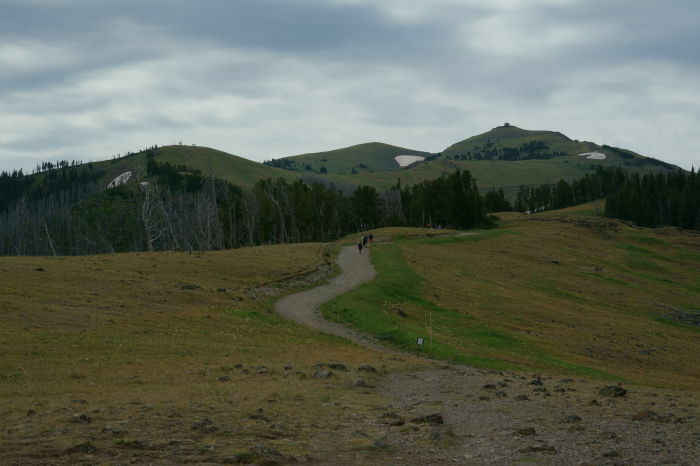 The hike to the top of Mount Washburn is 3.2 miles (one way) and it gains 1,400 feet. That means it would be a fairly exhausting climb to the top. I would guess that you’d need about 4 hours, minimum, to hike this trail (unless you’re in great shape and routinely run trails). Since I was trying to see Yellowstone in one day, I didn’t have that kind of time, so I just went a short distance up the trail. Even with a ten-minute hike up the trail, you can find some amazing views. 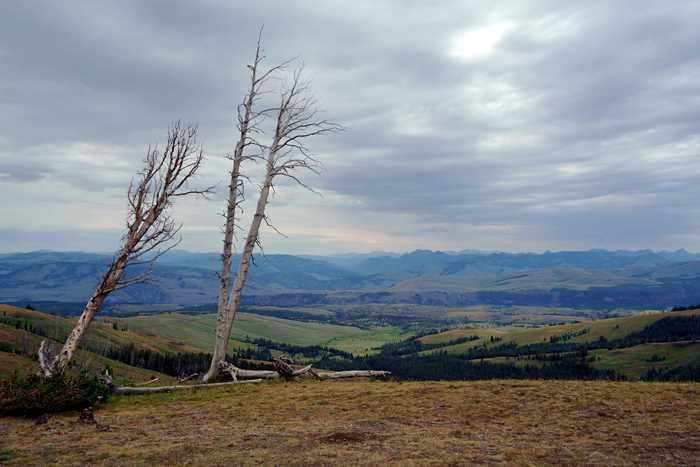 I hiked up to a plateau on the trail, where some tree skeletons provide a scenic foreground, with dramatic skies and a colorful valley in the distance. 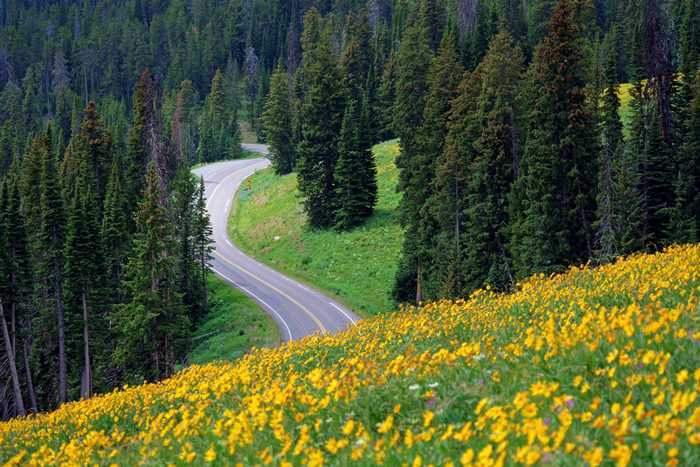 Once you’re back on the main road, you’ll reach a high point of 8,878 feet at Dunraven Pass. This spot on the highway would be unextraordinary, if not for the explosion of wildflower blooms on the hillside. I don’t know if it looks like this every summer, or how long it lasts, but it was quite a sight. It took a lot of effort to get all the people out of my pictures. Dozens of people were hiking up the hillside and taking photos of this wildflower bloom. The next big junction on the park’s scenic road is at Canyon Village. As the name suggests, there’s an entire village of restaurants and souvenir shops here. It’s a good place to grab some lunch if you don’t have anything in the car. 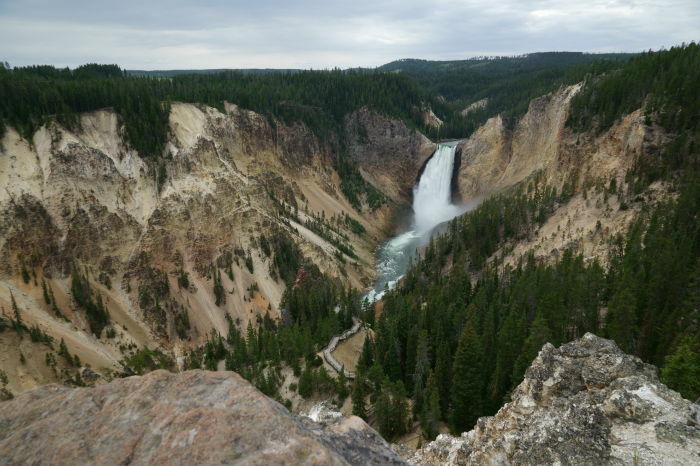 South of Canyon Village, you’ll find two options for viewing the Grand Canyon of the Yellowstone — the north rim and the south rim. From either side, you’ll have some great views of the canyon. I turned into the north rim and, with a great deal of luck, managed to find a parking spot. 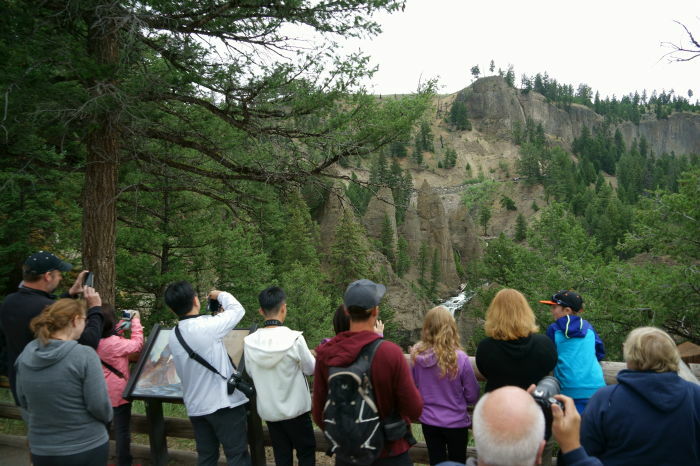 At first, I thought about hiking to the brink of the lower falls, but a bear sighting had forced park rangers to close that trail. So, I headed for the next closest viewpoint trail, which led to Lookout Point. At the end of that trail is where you will find the view you see in the photo above. There’s only one problem with the trail to Lower Lookout Point — the stairs. 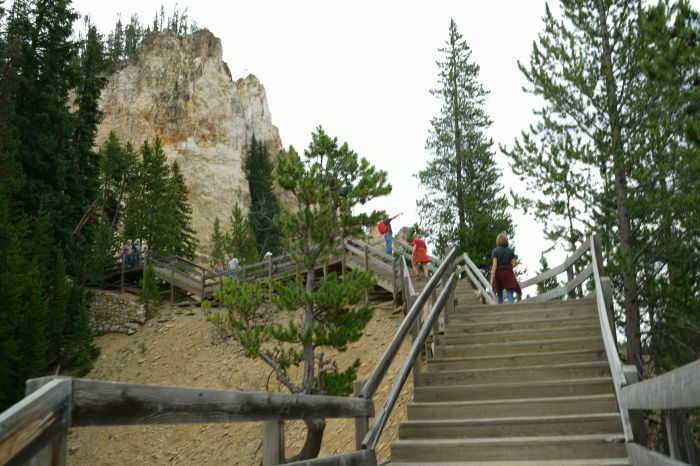 It’s only about a ten-minute walk down the trail to the lower viewpoint, but the climb back up will be much more difficult. You might be satisfied with the view from (upper) Lookout Point, which is right next to the road and the parking area. The view isn’t quite as good, but if you’re trying to see Yosemite in one day, this view might be good enough. There are also other viewpoints on the north and south rims, so take your pick. Leaving the canyon, drive back up to the junction and head west towards Norris, where you’ll turn south into the park’s biggest concentration of geysers. 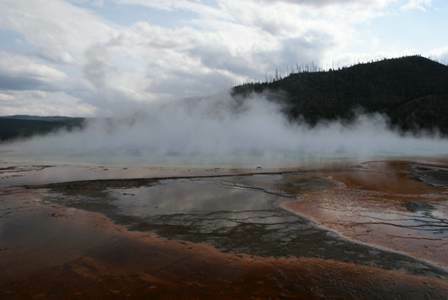 On your way to Old Faithful, you’ll pass several geyser basins. All are worth a stop, but since I was trying to see Yellowstone in one day, I decided to prioritize the Midway Geyser Basin, which is home to Grand Prismatic Spring. I tried for about a half-hour to find a parking spot, with no success. The park was so crowded that traffic was creeping through a completely full parking area. Tempers flared as everyone jockeyed for the occasional spot that would open up. After a while, I simply had to give up and drive out of the parking area. So, here’s a picture from my previous visit. As an alternative to the parking lot, you could park along the park road and walk in. Plenty of people were doing it, but after my hike to the Grand Canyon viewpoint, I didn’t have the time for another long walk. When I finally made it to Old Faithful, I struggled once again to find a parking spot. And that’s pretty remarkable, considering that the development around Old Faithful is immense. The park road basically turns into a freeway through the area, with multiple lanes exiting. It’s like pulling into the parking lots at Disney World. However, this was mid-July, and the crowds were overwhelming. Once I had parked, I made my way towards Old Faithful, wondering if I’d luck out with an eruption sooner, rather than later. 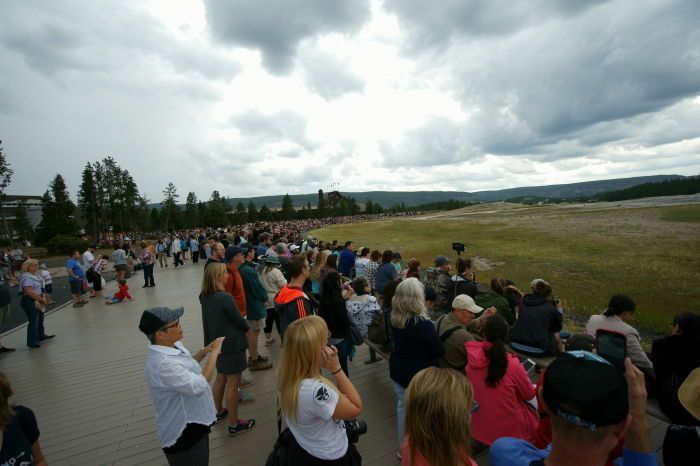 A wide deck encircles Old Faithful, and it was packed with people. There was no way I’d get closer than 3 or 4 people back from the front line. The crowd stretched out for as far as I could see. I figured, with so many people standing around, the eruption must be imminent. 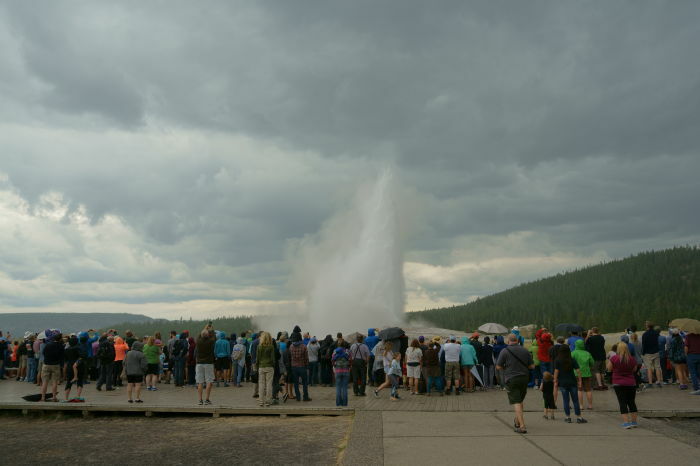 People stood with their phones rolling, waiting for any signs of life from the famous geyser. Many minutes went by, and then it started raining. I wasn’t dressed for rain, and suddenly I was soaked and quite cold. Old Faithful sputtered a bit. It was a sort-of eruption that didn’t live up to my memories of grandeur. But, I figured, maybe that’s all it was going to do, this time around. As the rain intensified, I decided to head for the car. And of course, once I had given up my spot in the crowd, and gotten about a hundred feet away, I started hearing cheers and applause from the crowd. The eruption had picked up, and was quite a good display. Maybe it was better to have all those people in the photo, after all. The eruption ended, and I high-tailed it back to the car. Just like the end of the 4th quarter at a football game, everyone was on the move. In the next 90 minutes, an entire cycle would take place, with thousands of people leaving and thousands more arriving for the next eruption. 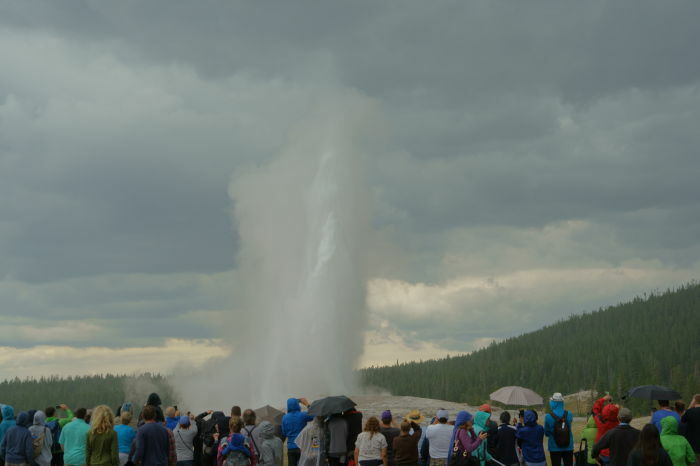 In most cases, Old Faithful erupts once every 90 minutes, give or take 15 minutes or so. But, it can go early, or in the case of my visit, surprisingly late. There are websites like geysertimes.org that track eruption times. If you’re somewhere in the park with cell phone coverage or wifi, you can try to check the schedule and plan your arrival accordingly. Old Faithful was my final stop in Yellowstone. I was frustrated with the crowds and parking situations, as well as the weather. Once it started raining, I gave up on exploring the park and headed for the exit. 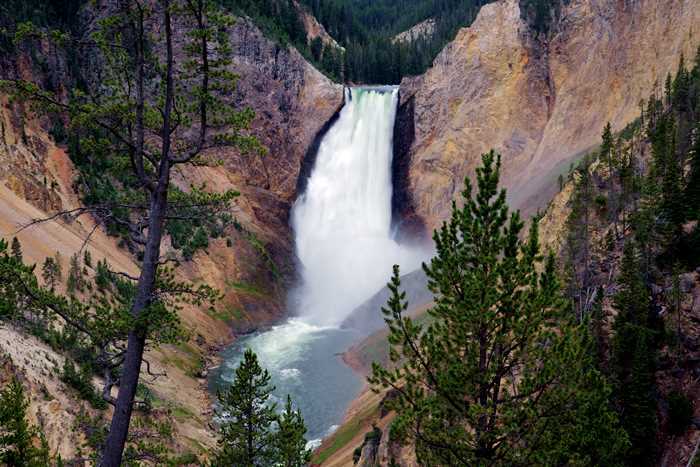 Just outside of Yellowstone National Park, you’ll find West Yellowstone. 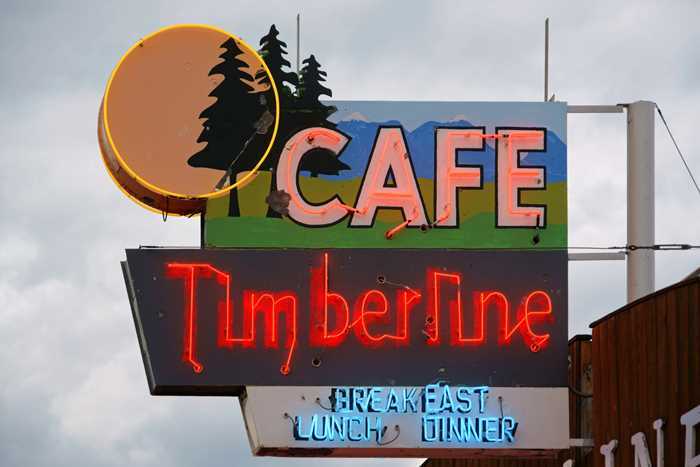 Blocks of tourist-friendly restaurants and motels begin as soon as you’ve crossed over the park boundary. 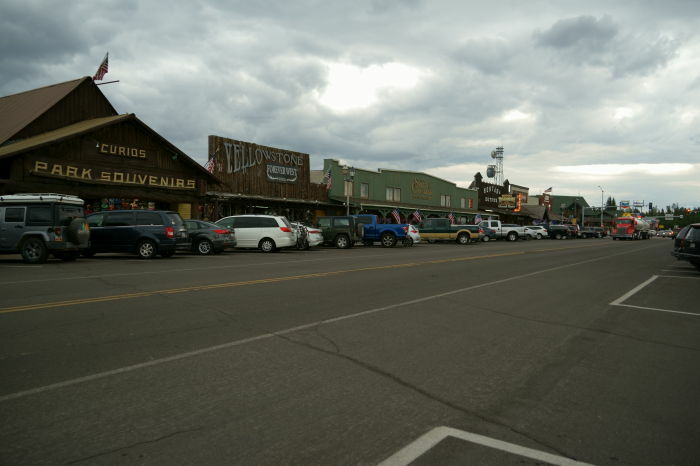 West Yellowstone provides a good base for exploring the park, without paying the expensive prices of in-park lodging, but it still isn’t cheap to stay here. I walked around for a few minutes and took a new picture of one of my favorite neon signs. The drizzle continued, though, and I decided that I wouldn’t be able to get much more out of this day. Fortunately, I was wrong. As I headed south on US 20 into Idaho, I realized that the weather was slowly improving. I decided to seek out one more photo opportunity, on the west side of the Tetons, before sunset. I’ll tell you how that went on the next page. Spending several days in Yellowstone would be ideal, but if you try to see Yellowstone in one day, you can still cover a lot of ground. Make sure you see the biggest attractions, like Old Faithful and the Grand Canyon of the Yellowstone. But, be aware that the park is miserably crowded at the peak of the summer season, and you may have trouble accessing some destinations.